The historic 2017 VSB Annual Meeting once again brought together lawyers and the judiciary from across the state to make policy affecting the profession, to induct the new VSB president, to learn at a number of CLEs, to connect with other lawyers in the full spectrum of practice areas, and to celebrate those who have made a lasting contribution to the profession. Each year a number of awards are given at the annual meeting, and the words of the recipients as they accept those awards are often as remarkable as the recipients themselves. Linked here are the acceptance speeches of Angela Ciolfi (Virginia Legal Aid Award), Joe Condo (Clarence A. Dunnaville Jr. Achievement Award), James Moliterno (William R. Rakes Leadership in Education Award) and Amber Strickland (Oliver White Hill Law Student Pro Bono Award). 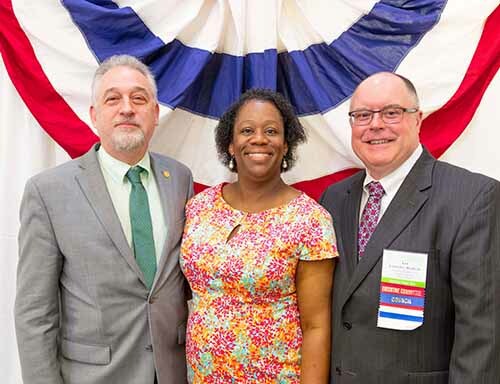 Caption: Immediate-past VSB president Michael W. Robinson (left) with 2017-18 president Doris Henderson Causey and president-elect Leonard C. Heath, Jr.